The first step I took into a transformative period in my life started with a simple awareness of what I was grateful for. That was the start of a journey in which I would ultimately become whole, feel comfortable in my own skin and at peace with myself. Of course with our loved ones, but additional opportunities arise throughout our day. On the phone, at the supermarket, dining at a restaurant - acknowledge a person's time, effort and service. Say thank you a few times during your interactions with people. Even when someone can't solve an issue, provide an answer or remedy, I thank them for their time. 2. More Of This Please! When you experience good feelings from something, acknowledge your pleasure by saying yes to having even more occasions to feel so fulfilled. I've said more of this, please! to swimming in warm water, beach walks, life adventures and moments when I feel incredible inner peace. By asking for more of what we are already grateful for, we are confirming and strengthening our blessings. 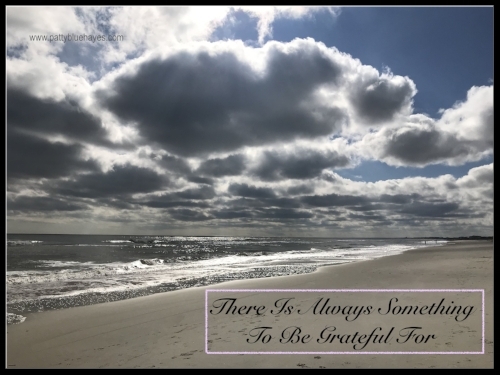 The time I am most grateful for having learned a valuable life lesson is in the moment before I potentially could have made a choice that would have created a repeat performance of an unpleasant experience. The recognition of an old habit or pattern that we're able to discontinue is an incredible gift to give thanks for. Doing laundry is one of the best examples of this. Most people don't like doing laundry. It's a chore that feels like a burden. Turn that chore into an opportunity to be grateful you have so many clothing choices and machines (perhaps right there in your home) to wash and dry them and make them smell like lavender blossoms. Mindfulness in the morning has an impact on our mood and mindset as we begin our day. Enrich your morning routine with a simple acknowledgement of what you are thankful for in the moment. Before sleep, review what you appreciated during your day. Want to make your gratitude practice more tangible? Why not keep a specific journal dedicated to your reflections on gratefulness? Or, write down a few things each day, slip them into the gratitude jar and at the end of the month or year, read them for an infusion of good feelings.